What is the best cheap bread machine? 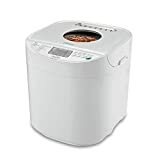 Pictured is the Oster CKSTBRTW20, our top choice for the best cheap bread machine. All you want to do is bake bread at home without spending an arm and a leg for a bread machine. Are there any affordable bread machines that will do a good job, not break the bank, and make delicious bread? Yes! 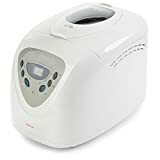 Below is a list of bread machines under $100 that all have high ratings based on hundreds of customer reviews. Cheap doesn’t necessarily mean bad quality. But you have to know which ones are good quality. So besides being cheap, we are looking for quality. The ones we have listed below do a great job baking bread and they tend to last years, making them truly value buys. Let’s take a deep look at each of them. You can pick up the Oster CKSTBRTW20 for about $60. But don’t let its price fool you. In our tests, the Oster CKSTBRTW20 performed way better than many machines that were priced above it. Its strength lies in its consistency. 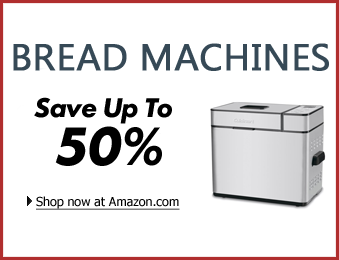 Your 100th loaf of bread will look and taste just as good as your first loaf of bread with this machine. 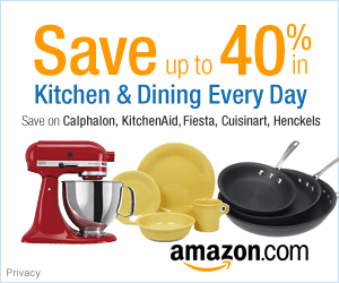 It handles gluten-free bread, specialty breads, jam, dough, and other pastries with ease. It’s easy to use, easy to clean, and quiet. There were really no complaints about the machine and still find it hard to believe it’s only $60. If we had to nitpick about something, it would probably be its design. It’s lightweight so it can feel flimsy, plus the exterior looks like a bunch of plastic slapped together. Once you get past the appearance and try to bake with it, the bread comes out better than most high-end machines. It’s truly a testament to never judge a book by its cover! You can read our full review of this machine here. The Hamilton Beach 29881/29882 is another good choice. It’s also priced at about $60. This bread maker will come in two different colors: 29881 is white, 29882 is black. We much prefer the black because it’s more unique for bread machines, but either of the colors will match well with your kitchen. We like this machine particularly because it bakes fantastic whole grain bread. Of course, it does other things well, but this machine was built with nutrition in mind so we wanted to point out its strength. 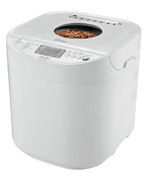 If you want an affordable bread machine that can handle whole grains well, this is the one. Whole grain breads can be expensive to buy in store so we really want to recommend baking your own if you want to save money. And this is the machine to do it with. We have also tested this bread machine thoroughly, so make sure to check out our complete review here. A few years ago, you could buy the Sunbeam 5891 for about $40 online. We also heard that some customers bought the bread machine at their local store for as little as $15! But perhaps the popularity of the machine has come to the attention of manufacturers and retailers, because we could no longer locate the bread machine at those prices. Right now it sells for about $60-$75 online, which is still a very cheap model, but we had to move it a little bit down our ranking considering its competition. Having said all that, the Sunbeam 5891 is still a great bread maker. There’s an express function which bakes bread in 1 hour. We love the color it achieves on the crust. It will bake bread well, but there’s a drawback. It’s a light machine that tends to move a bit too much. So you have to be careful using it and making sure it doesn’t fall off the counter or anything. Yet for the price we think anybody will be happy with what it does despite this flaw. You can dive deeper by reading our Sunbeam 5891 review here. We weren’t sure whether we should add the Cuisinart CBK-100 to the list because it may be stretching certain wallets at about $100. But we decided to because all the cheap bread machines above don’t quite exactly come with “style”, and we thought some of you might want to pay a little more for a bread machine with a beautiful design that’s still relatively affordable. As you can see, the Cuisinart CBK-100 is a rectangular shaped machine with a shiny stainless steel shell. It looks just as nice as the high-end bread makers. There are handles on the side for easy carrying if you need to move it into storage. It sounds like a high-end machine too, with beeping alarms to indicate when you should incorporate nuts and fruit. Functionality-wise, it passes all our tests (see our review). So if you don’t mind stretching your tight budget for a nice-looking bread maker, then definitely go for this one. All I want is a machine that will knead and bake the bread right. I like to eat blueberry bread and my wife likes all kinds of sweet breads too. And I am not smart enough to own a machine with too many controls or options. I just want a good breadmaker that won’t break the bank and that will last. Thank you. 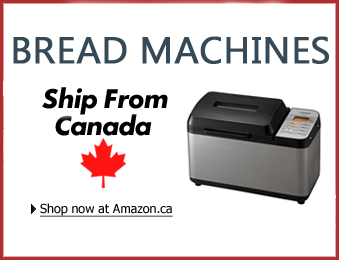 We’re not really familiar with the stores in your area but as far as we know Amazon Canada should carry the same bread machines as we list here!